The last several weeks I have been doing some genealogy research on my family and came across some cool information dating all the way back to the 1700's. Tracing my ancestry back to Germany, Sweden and Norway, I found my mouth watering for my Grandmother's Swedish Meatballs! With my diet restrictions in mind (dairy & gluten free) I decided to conquer her recipe while substituting my healthier options when necessary. To my surprise they turned out AMAZING!! I really enjoy them with roasted veggies like carrots, asparagus and a few fingerling potatoes. I hope that you enjoy the warmth of my favorite family comfort food as much as I have. In a large bowl, break apart the gluten free bread into large pieces. Add almond milk and toss to coat. Set aside. In a medium saucepan, saute onions and butter until translucent, about 4 minutes. Add chopped garlic and cook 2 minutes. Drain off excess almond milk from bread. Add sauteed onions and garlic to bread. Stir, then add eggs, parsley and salt & pepper. With a handheld mixer, mix ingredients on low-med until well combined. Add ground beef and continue mixing with handheld mixer until all ingredients are well combined. Preheat oven to 400F. 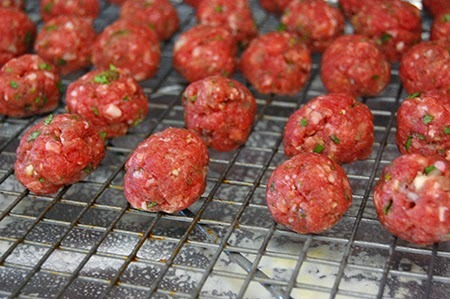 With a spoon, scoop mixture into your hands and roll all remaining mixture into meatballs. Place meatballs on a rack that fits into a baking pan. Place meatballs in the oven and bake 20 minutes or until no longer pink inside. Remove from oven and serve or refrigerate for up to 5 days. These meatballs also freeze really well!